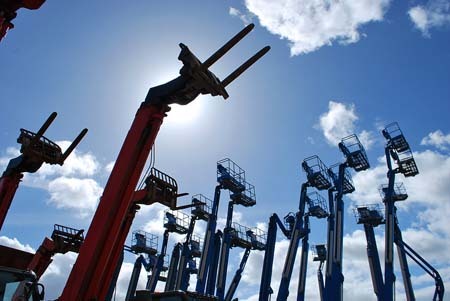 Clark is one of the oldest and most respected names in materials handling equipment. Back in 1917, it was Clark that introduced the world’s first internal combustion materials handling vehicle. The “Tructractor” was an instant success and led to the development of many other Clark industry “firsts,” including the world’s first internal combustion lift truck to use hydraulics instead of a mechanical lifting mechanism. While you probably don’t want one of these used Clark forklifts unless you’re a museum curator, if you’re looking for tough, reliable used forklifts for sale, you can’t do better than Clark. 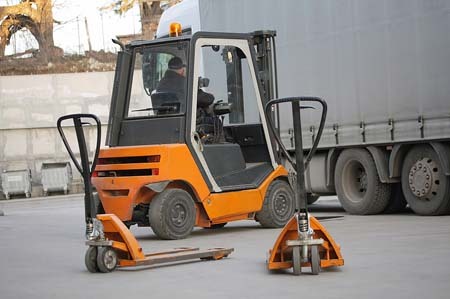 6 Electric Forklifts with carrying capacities of up to 15,400 lbs. That alone is an impressive range of vehicles, but many of these also come in a variety of models for different load capacities and applications. For example, there are 4 diesel/LPG models in Clark’s range of rugged IC pneumatic tire forklifts designed for heavy manufacturing. The Clark ECX range of electric forklifts designed for manufacturing, warehousing and distribution is another example of the wide selection of quality new and used Clark forklifts on the market. When you browse the huge inventory of used forklifts here on ReconditionedForklifts.com, you may be surprised to discover just how much you can learn from our product descriptions alone. You can see at a glance whether a vehicle is sold in “As Is – Parts Only”, “As-Is”, “Guaranteed Operational” or “Reconditioned” condition. All details about the truck are listed and where photographs are available, they are not doctored in any way: what you see is what you get. To find out more about these classifications, check out our article, About Reconditioned Forklift Types. On occasion, you may not see an image accompanying a used lift truck. This is most likely because it has just come into our inventory. That’s one of the reasons why we prominently display a “Request Product Info” button next to the price sticker. We encourage you to know everything about a used forklift you are considering buying from us before you make your purchase. Purchasing a used forklift is never an easy decision. You will probably want to consider several before you make your final decision. That’s why we make it easy for you to compare vehicles by providing one click “Download PDF”, “Print” and “Add to Watchlist” buttons. Our commitment to your satisfaction doesn’t stop with our “virtual” showroom, either. Reconditioned Forklifts is not just a website, it is a team of dedicated professionals backed by Bahrns Materials Handling & Supplies Company, an Illinois based company with a solid history of service behind it. For more information about our company, our services or a specific used Clark forklift or other quality brand you are interested in, email support@bahrns.com or use our contact form. We also welcome hearing from you personally, so don’t hesitate to call us during normal working hours (8am-5pm CST M-F) at 1-855-742-0159.